Microbiologist Mabel Torres grew up in one of Colombia’s poorest regions and returned to combine science and entrepreneurship and launch a growing ecosystem of economically and environmentally successful businesses. In the Colombian rainforest, Mabel melds modern science and ancestral plant knowledge to stimulate local development. She built an internationally recognized science and technology hub that develops and improves area products, expands local enterprise, and connects producers to a market for their goods. In a region that suffers from severe isolation and poverty with few economic alternatives to exploitative extractive industries, Mabel promotes micro-enterprises that use local ingredients to produce food, medicinal products, and cosmetics. She makes sure these products reach outside markets. In 2012, Mabel created BIOINNOVA and the National Center for Science, Technology, and Innovation for Productive Sustainable Development of Biodiversity to drive a new local economy of bio-entrepreneurs and improve quality of life for the population while preserving the biodiversity of the region. The result of Mabel’s work is a growing network of local producers and companies that link to and leverage each other while adding value to natural resources and creating sustainable products. BIOINNOVA has worked directly with 600 producers across 60 distinct enterprises in 15 different municipalities. Ten of these enterprises are now running independently, having achieved economic and environmental sustainability. Currently, 90% of the initiatives supported by Mabel have the capacity to supply local markets, and 10% are ready for medium-sized markets. The enterprises are creating hundreds of jobs, through which many people are moving from unemployment to earning approximately $270 a month, on average. BIOINNOVA has helped certify the first cleaning products and natural cosmetics factories in the Colombian Pacific, as well as two more food production industries. Mabel has also successfully created the first “bioeconomy and culture festival” to promote the local entrepreneurs and their products. 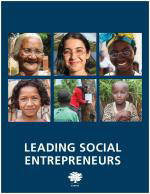 Mabel' s story appears in the 2018 edition of "Leading Social Entrepreneurs" which features a selection of just a few of the Ashoka Fellows recently brought into the largest global network of social entrepreneurs. The LSE presents some of the newest innovations by leading social entrepreneurs whose ideas are changing the way things are done all over the world.